The dirt road through the Golden Valley was once known for its gentle hills, immaculately kept inns, and friendly merchants, but in these troubled times, travelers are as likely to meet with bandits as they are fellow samurai. “Wedding at Kyotei Castle,” (2.5 MB) a standalone introductory scenario for the Legend of the Five Rings Roleplaying Game is now available for download! Lord Tsume Takashi, a vassal of the Doji family, inherited the strategically placed Kyotei Castle through his ruthless father’s belligerence. One generation ago, the castle belonged to the Damasu family, vassals of the Lion Clan. To shore up the Crane Clan’s logistical lines to Toshi Ranbo (and to fuel his own ambition) Lord Tsume Retsu besieged the castle, eventually overcoming its defenses and slaughtering every member of the Damasu family. It was all the Crane Clan’s diplomats could do to prevent the Lion Clan from declaring a blood feud and to assuage the worries of the Phoenix Clan lords, who feared they would be the next targets of Retsu’s fury. 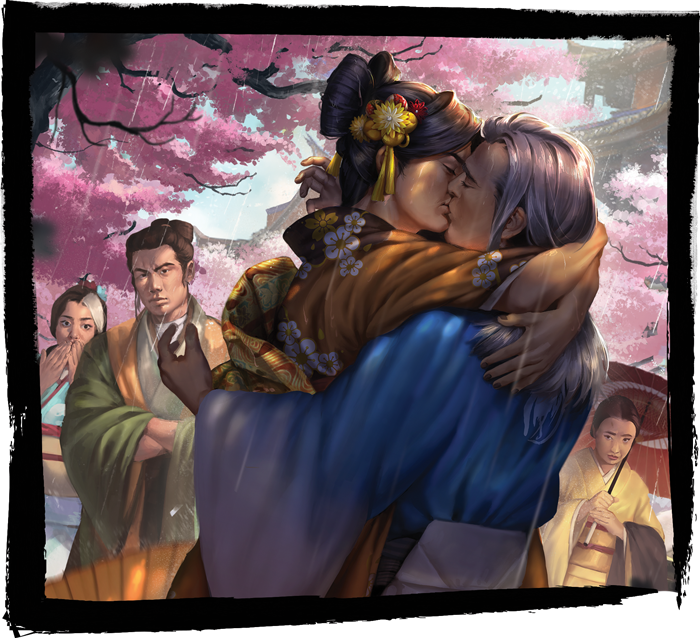 "Wedding at Kyotei Castle" debuted at Gen Con 2018, and the results of the nineteen sessions played there will help forge the ongoing storyline of Legend of the Five Rings! You can read on to learn how the groups at Gen Con chose to play the scenario and the impact that has for the future. Before playing the scenario, each group at Gen Con was asked to decide whether party conflict would be permitted during their session, or if their group would have to come to a consensus when making decisions. 63% of all groups decided to play cooperatively and avoid intraparty treachery or secrets, while the remaining 37% chose competitive play, willing to face down their fellow PCs if their agendas ultimately clashed with those of their allies. The main choice to be made was whether the party would support the Lion Clan’s long-lost heir, Damasu no Akodo Maeda—one of the wedding’s most unexpected guests. Raised as Reika the geisha in Pine House in the shadow of Kyotei Castle, she didn’t know that one of her father’s sworn samurai had smuggled her out of the castle as a baby during Tsume Retsu’s slaughter. This same retainer kept watch over her until she came of age, when they revealed her true identity. She swore revenge against the Tsume family and began training in swordsmanship. Tsume Takashi was a frequent visitor to her geisha house, so she played at being his lover in order to gain access to the castle, where she murdered his father three years ago. The truth of her crime was never found, and Reika fled the city not long after to rejoin the Lion Clan. The Lion Clan Champion accepted her as the legitimate heir to the Damasu, and she took the name Maeda. She accepted Takashi’s wedding invitation on behalf of the Lion Clan, which the Crane had extended out of courtesy but did not expect to have accepted due to the bad blood. There, she plotted to marry Takashi but rule as lord, returning the castle to the Lion Clan in the process. Many of the groups who played competitively proved more willing to challenge the Crane’s dominion over Kyotei Castle. 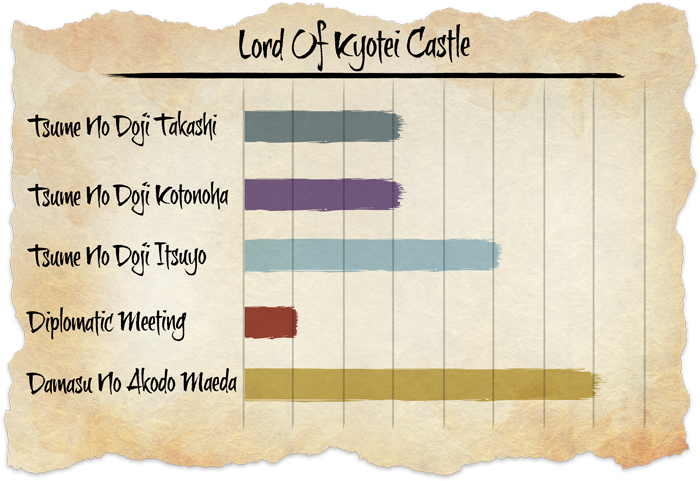 Seven groups in total (37%) sided with the Lion Clan and supported Damasu Maeda’s claim to the castle. One group refrained from backing any single clan, instead negotiating a truce during which Maeda’s claim could be validated and a path to peace in the region found. Overall, however, it was the Crane Clan that prevailed (58% of all sessions), but different samurai were installed as lord depending on the outcome of the PCs’ choices. If Tsume Takashi was killed during the ambush on the way to the shrine, his heir and captain of the guard, Tsume Kotonoha, would be lifted as heir instead (27% of the Crane-loyal groups). The same percentage convinced Tsume Takashi to accept his duty and stay on as lord, despite his disinterest in the responsibilities. Ultimately, however, it was the newly married Tsume no Doji Itsuyo who became the custodian of the valley (46% of all Crane groups), sealing the alliance between the Crane and Phoenix Clans. 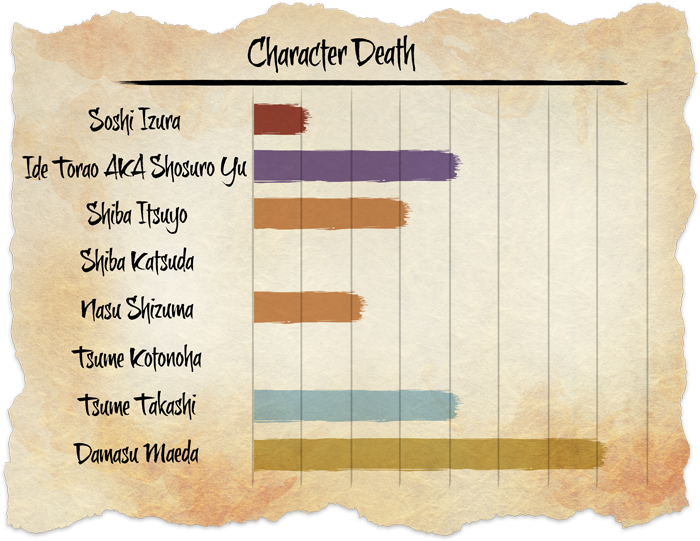 In the process, Damasu Maeda was slain, either by Shiba Itsuyo in single combat or by the combined might of the player characters. Tsume Takashi, heartbroken at being united with his former lover only to lose her again, resigned his position and committed seppuku after fulfilling his last duty as lord in marrying Itsuyo. Now, Tsume no Doji Itsuyo, a trained warrior and willing leader, has flourished in her new role. 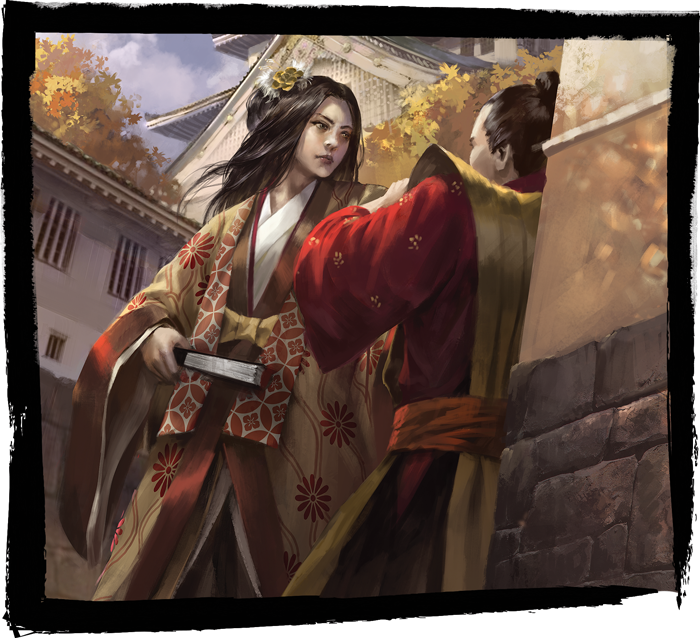 Doji Kuzunobu, husband to Doji Hotaru and one of the wedding’s guests, accepted her oaths of fealty to the Doji family and recognized her as the new lord. Though Toshi Ranbo has been named an Imperial City under chief magistrate Bayushi Yojiro, the Crane Clan maintains an outpost in the region at Kyotei Castle. Most importantly, if the Lion Clan threatens the Golden Valley, they know that the Shiba family will defend their daughter’s claim. What would you have chosen—and what does Bushidō demand? Does the Tsume family’s sins justify Reika’s past as a murderer? Or does the Tsume family retain the right to the castle? You can still determine the outcome in your own campaigns by attending the “Wedding at Kyotei Castle” and deciding whether love or duty will win the day! 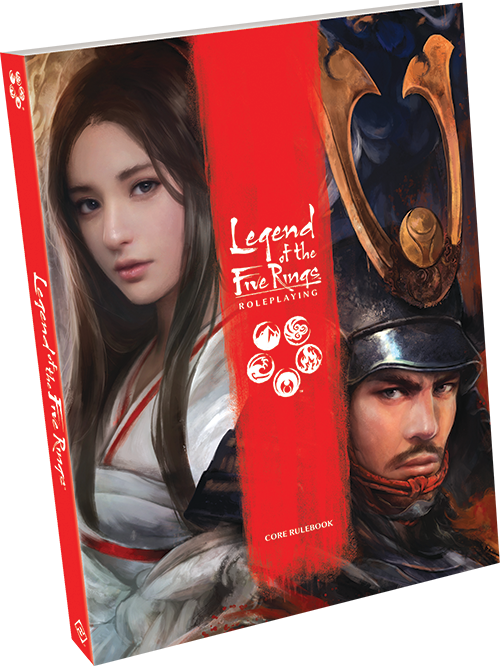 To enter the land of Rokugan, you can pick up the Legend of the Five Rings Roleplaying Game Core Rulebook (L5R02) at your local retailer or online through our website here! And be sure to download your copy of “Wedding at Kyotei Castle” here!